Brush the poblano chile peppers with the canola oil. Place the peppers on a sheet pan. Roast the peppers in the oven for one hour until the skin begins to turn dark brown and blister. Let the peppers cool for 15 minutes. Remove as much of the charred skin as you can along with the seeds and the stems. Try to keep the peppers in one piece. Cut a slit on one side of the peppers so that you can stuff them with the rice. Into a mixing bowl, add the cooked rice, half of the shredded cheddar cheese, the garlic, the scallions, the crushed tomatoes, the cumin, the red chile powder, the sea salt, and the red cayenne pepper. Mix until all of the ingredients are well incorporated. Add the red chile sauce to a baking dish and spread it out evenly. Fill each poblano pepper with the rice mixture. 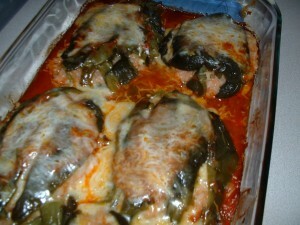 Place the stuffed peppers into the baking dish. When all of the peppers have been filled and placed in the dish, sprinkle the remaining cheddar cheese uniformly over the top of the peppers. Cover the baking dish with aluminum foil and bake the peppers in a preheated oven set at 350 degrees for 45 minutes. Serve with sour cream or guacamole. Add a cup of cold water to a sauce pan. Put the pan on high heat and bring the water to a boil. When the water begins to boil, add the dried chiles. Let the chiles sit in the water for twenty minutes. After twenty minutes, take the chiles out of the water and remove the stems and the seeds. Set the hydrated chiles aside. Into a sauce pan, add the canola oil, the red onion, two minced garlic cloves, the oregano, the cumin, a teaspoon of sea salt, and 1/2 teaspoon of red cayenne pepper. Cook on medium heat stirring frequently for 3-4 minutes. Add the white wine. Cook for an additional two minutes. Add the tomato puree, the chicken stock, and the hydrated chiles. Cover the pot and reduce the heat to low. Cook while stirring occasionally for 40 minutes. After 40 minutes, turn off the heat. Let the mixture cool for 30 minutes and then place it into a blender. Blend the sauce until smooth. Place the sauce into a mixing bowl. Into another mixing bowl, add the cream cheese, half of the cheddar cheese, the scallions, a minced garlic clove, the chile powder, a teaspoon of sea salt, and 1/2 teaspoon of red cayenne pepper. Mix until all of the ingredients are well incorporated. Wrap the tortillas with a damp paper towel and microwave them for two minutes until the tortillas are pliable. Dip a tortilla into the red chile sauce so that it gets coated slightly on both sides with the sauce. Place about three tablespoons of the creamed cheese mixture in the center of the tortilla and roll the tortilla up like a cigar. Place the filled tortilla into a greased baking pan with the seam side down. Continue this process until all of the tortillas are filled and placed side-by-side in the baking pan. Pour the remaining red chile sauce on top of the filled tortillas and spread the sauce out evenly. Top the tortillas with the remaining shredded cheese. Note: You can add more cheese on top, if desired. Cover the baking pan with aluminum foil and bake in a preheated oven set at 350 degrees for 45 minutes. Put the flour on a plate. Add 1/2 teaspoon of sea salt and 1/4 teaspoon of ground black pepper to the flour. Mix well. Into a shallow bowl, add the beaten egg, the water, 1/4 teaspoon of sea salt, and 1/4 teaspoon of ground black pepper. Mix well. Add the grated cheese to the bread crumbs and mix well. Spread the bread crumb and cheese mixture out evenly on a plate. Dredge a chicken cutlet in the flour. Shake off the excess flour and place the chicken cutlet into the egg and water mixture. Make sure that the chicken cutlet is coated evenly with the egg mixture. Finally, place the chicken cutlet into the bread crumbs. Coat the chicken cutlet uniformly with the bread crumb mixture. Repeat the process until all of the chicken cutlets are breaded. Place the breaded chicken cutlets on a plate. Into a 12-14 inch non stick saute pan, add the olive oil. Put the skillet on medium high heat. Heat the olive oil for five minutes. Place two chicken cutlets at a time into the pan. Saute for about 3-4 minutes on each side until the bread crumbs turn golden brown. Remove the cutlets to a sheet pan lined with parchment paper. 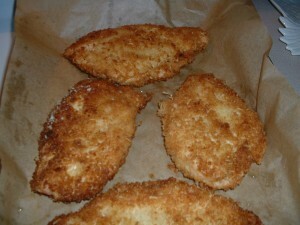 Bake the chicken cutlets in the preheated oven for 15 minutes. Serve with lemon wedges. Into a soup pot, add the olive oil and the pancetta. Cook on low heat until the pancetta becomes crispy. When the pancetta is crispy, turn the heat up to medium high and add the carrot, the celery, the onion, the garlic, the crushed red pepper flakes, the sea salt, the bay leaf, the basil, and the marjoram. Cook while stirring frequently for six minutes. 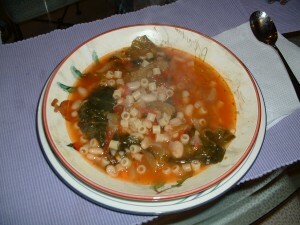 Add the hand crushed tomatoes, the cannellini beans, the escarole, the Romano cheese, and the water. Stir the mixture well. Tie the parsley sprig, the rosemary sprig, and the thyme sprig into a bundle with cooking twine. Drop this herb bundle into the soup pot. Cover and bring the mixture to a boil. After the soup begins to boil, cover the pot and reduce the heat to low. Simmer for 30 minutes stirring occasionally. After the soup has simmered for 30 minutes, remove the bay leaf and the herb bundle. Taste the soup and add more sea salt and/or crushed red pepper flakes, if desired. Add the cooked pasta to the soup and stir it one more time. Turn off the heat and serve. Add the ground beef to a mixing bowl. Season the ground beef with a teaspoon of sea salt and 1/4 teaspoon of ground black pepper. Into a saute pan, add the olive oil, the celery, the onion, the green bell pepper, the garlic, a teaspoon of sea salt, and 1/4 teaspoon of ground black pepper. Cook while stirring frequently on low heat for 5 minutes. Remove the vegetables from the heat. To the mixing bowl with the ground beef, add the bread crumbs, the cooked vegetables, the water, the tomato sauce and the hot sauce. Using your hands, mix well. Add the beaten egg and mix until the egg is well incorporated throughout the meat loaf mixture. With your hands, form the meat mixture into a loaf about a foot long, 3 inches deep and 5 inches wide. The meat loaf does not have to have these exact dimensions. Place the three slices of bread in the middle of a sheet pan. Set the formed meat loaf directly on top of the bread slices. By utilizing the bread slices in this manner, all of the fat of the meat let out during the cooking process will be absorbed by the bread instead of being released onto the sheet pan. Bake in the oven for 1 and 1/2 hours. Let the meat rest for about 10 minutes before slicing. 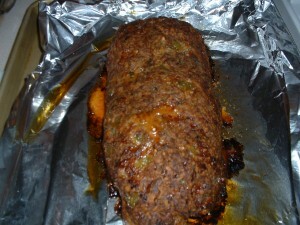 Remove the bread slices from the bottom of the meat loaf before cutting. Into a saute pan, add the sesame oil, the canola oil, the zucchini, the scallions, the garlic, the ginger, and the sea salt. Cook on low heat while stirring frequently for 5 minutes. Remove the vegetables from the heat. Into a mixing bowl, add the shrimp, the cooked vegetables, the bread crumbs, the lime juice, two tablespoons of soy sauce, and a tablespoon of Sriracha sauce. Fold all of the ingredients together. Add the egg whites and fold them into the shrimp cake mixture. Spray a 1/4 cup measuring cup with cooking spray. 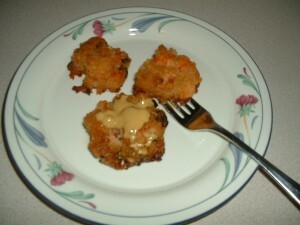 Use the measuring cup to form the shrimp cakes by filling the cup to the top with the shrimp cake mixture. Place the formed cakes on a sheet pan. 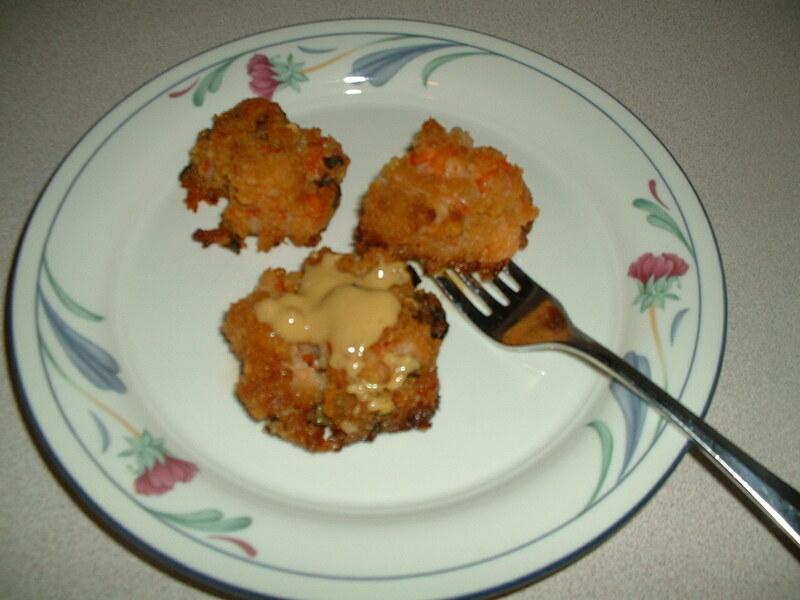 After all of the mixture has been formed into cakes, place the sheet pan containing the shrimp cakes into the refrigerator for at least two hours. Let the shrimp cakes sit out at room temperature for at least 30 minutes before baking. Bake in a preheated oven at 350 degrees for 40 minutes until the shrimp cakes are golden brown. Into a mixing bowl, add the mustard, the honey, a teaspoon of soy sauce, and a teaspoon of Sriracha hot sauce. Whisk until well blended. Refrigerate for at least one hour before serving. Mix together the Chinese five spice and the sea salt. Rub this spice mixture all over the flesh side of the pork ribs. Tightly wrap the ribs with plastic wrap and then wrap them again in aluminum foil. Place this rib package on a sheet pan and put the pan in the preheated oven. Bake for four hours. Let the ribs cool for at least 30 minutes. Unwrap the ribs and place them flesh side up on a sheet pan. Retain about 1/4 cup of the rib drippings. Into a sauce pan, add the rib drippings, the ketchup, the soy sauce, the rice wine vinegar, the hot pepper sauce, the garlic powder, the onion powder, the ginger, and the light brown sugar. Cook on medium heat while stirring for 5 minutes. Remove the sauce from the heat. 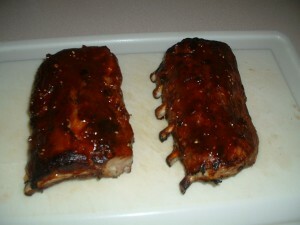 Brush the flesh side of the pork ribs generously with the barbecue sauce. Bake the ribs in the preheated oven for 30 minutes. Brush the ribs again liberally with the sauce. Cook for an additional 15 minutes. Let the ribs cool for 10 minutes before carving. Cut the ribs in between the rib bones and serve. 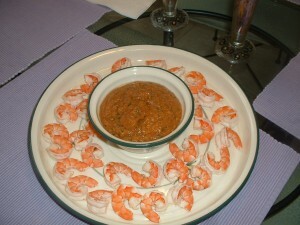 Place the shrimp, the juice of 1/2 lemon, and 1 1/2 teaspoons of sea salt into a pot. Add enough cold water to just cover the shrimp. Put the pot on high heat and bring the water to a boil. As soon as the water begins to boil, turn off the heat. Drain the shrimp in a colander. Refrigerate the cooked shrimp for at least two hours. Into a food processor, add the ketchup, the mayonnaise, the horseradish, the celery, the roasted red pepper, the juice of 1/2 lemon, the hot sauce, the Worcestershire sauce, the capers, the garlic, and a teaspoon of sea salt. Pulse until smooth and well blended. Taste and add more sea salt and/or hot sauce, to taste. 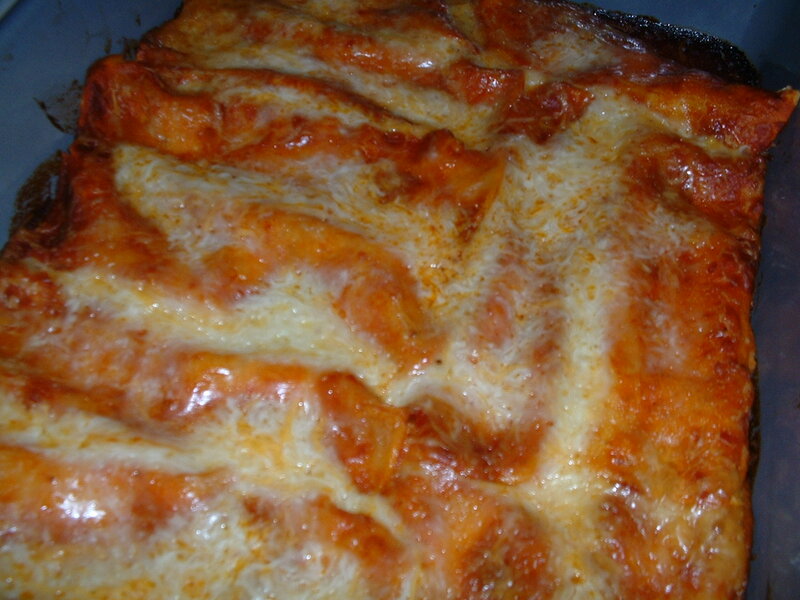 Refrigerate the sauce for at least two hours. Into a mixing bowl, add the garlic, the thyme leaves, the parsley, the rosemary, a teaspoon of sea salt, and the black pepper. Mash with a fork to form a paste. Add the anchovy paste. Mash again. Add the red onion, the mustard, the lemon juice and the red wine vinegar. Whisk the mixture until well blended. While whisking, slowly drizzle in a cup of olive oil. Continue to whisk until the dressing is smooth and thickened. Taste and add more sea salt and/or black pepper, to taste. Into a small bowl, add the paprika, the red cayenne pepper, and 1/2 teaspoon of sea salt. Mix well. Rub the flesh side of the salmon filets with this spice mixture. Heat a non stick oven proof pan on medium high heat for five minutes. Add two teaspoons of olive oil making sure to coat the pan evenly with the oil. Add the salmon filets flesh side down. Cook on medium high heat for two minutes. Turn the salmon filets over and place the pan into the oven. Cook the fish for an additional ten minutes. This dish is meant to be served family style. Place the lettuce in the center of a large platter. 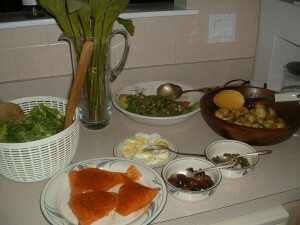 Set the salmon filets on top of the lettuce. 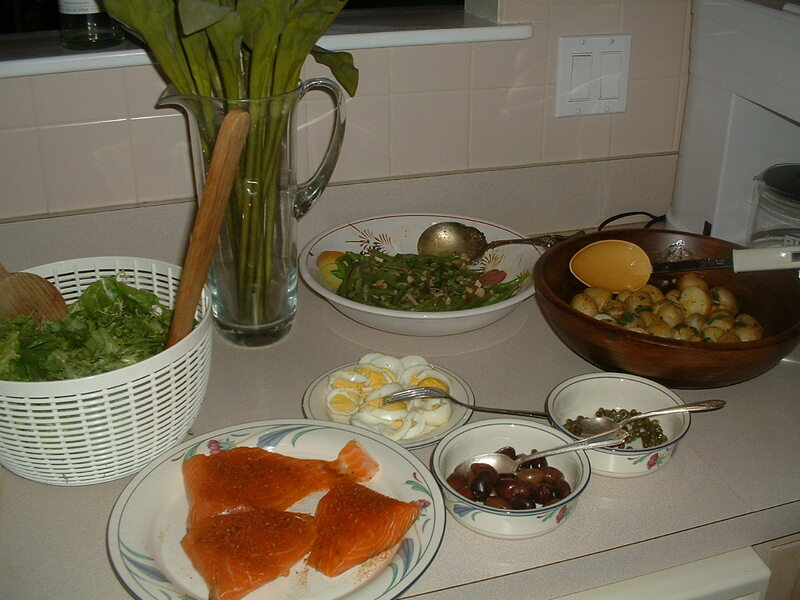 Around the lettuce, arrange the potatoes, the green beans, the hard cooked eggs, the olives and the capers. Drizzle the dressing over the top of the potatoes, the salmon, the green beans, and the lettuce. Serve any leftover dressing on the side. Serve with crusty bread. Into a mixing bowl, add the honey, the mustard, the vinegar, the thyme, the scallion, the sea salt, and the black pepper. Whisk the mixture until smooth and well blended. While whisking, slowly drizzle in the olive oil. Continue to whisk until a creamy consistency is achieved. Note: you may need to add more honey and/or mustard to attain the specified texture. Taste and add more sea salt and/or pepper, if desired.